The previous blog, 1963 – Jamaican Wedding Cake contained the usual selection of old-time black and white photographs from Cecil Hodgson’s albums. The years were now moving quickly forward and the world of colour photographs are beginning to appear more often. We are now in the year 1964…. SOUTHFIELD 1964: My dad’s sister, Cisline Hodgson, was still ‘Back Home’ at Southfield. During this year she married her Jamaican, partner Kenworth Stanford Powell. 1964 Marriage Of Cisline Hodgson & Kenworth Stanford Powell. From The Left, Reginald Speid, Kenworth, Cisline, Bridesmaid Nelly/Nellie Bent, And Brother In Law Of Kenworth, Ronny/Ronnie. Aunt Cissy’s family would eventually go on to be the last members of the Southfield Hodgson’s to leave the island of Jamaica. WEST BROMWICH 1965: Ida Mae Burkley visited England again. We now skip forward two years…. NEW YORK 1965: Maurice Vincent Hodgson (Vin) was the son of Cecil’s eldest brother, Maurice Hugh Hodgson. Vin had left Southfield many years before to go to America. He had a wife and family in New York. With his roots now firmly set in New York, he had been away from his Jamaican home for 24 years and had not once ventured Back Home since his move to the States. SOUTHFIELD 1967: Vin and his wife Mildred Hodgson – née Porcher – travelled to Jamaica. Mildred had never seen her husband’s childhood home, although she had probably heard much about it from her husband. They visited Vin’s Uncle and Aunt, Les & Phyllis Hodgson at Southfield Pen. When Vin had left home to go to America in 1943, there used to be many family members at Southfield – his grandparents Mass Teddy & Mabel, uncles & aunts, and many cousins including my dad, Renford. The family had since dispersed, nearly all of them had now gone, either deceased or emigrated. Southfield Pen was now such a very different place, everything had changed. Vin, recalled to me in 2002 that he moved into Southfield Pen as an infant in 1924 and lived there with his grandparents until he was 19 years old. He had lots of good memories of his time at Southfield. As he got older, Vin would ‘cultivate’ in the field with his elderly grandfather Mass Teddy. On occasions he would even visit the rum bar with his grandfather. Vin was given chores and used to ride a donkey 7 miles to Teddy’s sister Emmy to fetch mango. He said he remembered Mass Teddy and his children making their own rope on an old antique mangle, emphasising to me that the Southfield Hodgson’s had always been a self-sufficient farming family that wanted for nothing. The Hodgson’s were long-established at Southfield and had lived by their own means producing their own foodstuffs and other items. They grew and produced everything they needed, tobacco, coffee, oranges, lemons, mango, meat, poultry, vegetables, fruit, milk, eggs and just about everything else. They didn’t buy anything! Les Hodgson had taken over the farming residence and been the owner of Southfield Pen since his father’s death a decade before. Although he still rode horses and reared animals just like his Southfield ancestors had done centuries ago, Les would now drive his blue pick up truck down to the local stores to buy local produce. How life had changed at Southfield since Vin had been away. 1967 Les Hodgson. Owner Of Southfield Pen. 1967. Part Of The Hodgson Home Can Just Be Seen On The Right. Did You Notice The Red Soil? Since becoming an independent country in 1962, Jamaica had developed strong ties with the United States, who had tapped into the Jamaican market and discovered Bauxite (Aluminium) in the red dirt of Saint Elizabeth. America was now heavily mining the soil to extract this precious commodity. It is unsure sure how long Vin & Mildred stayed at Southfield, but eventually their stay was over and it was now time for them to leave. Just as they were walking away from the Hodgson’s historical home, Mildred turned around to have just one last look at the house. Instinctively, she took her camera out and snapped the frontal view of her husbands former home, Southfield Pen Great House. That was to be the last time that Vin ever saw Southfield. When he walked away that day, he made a promise, never to return, and he never did. I’m extremely grateful that his wife Mildred, clicked the shutter on her camera that day in 1967. That colour photo turned out to be the oldest photograph in existence of the old Hodgson home. Or does an older one exist? Mildred Took One Last Look At The Hodgson Home. A quick detour to 2006…. A few years into the millennium – 39 years after she famously clicked the camera shutter at Southfield – Mildred mailed me some of the ‘original photographs’ from that visit. She sent them lovingly by old-fashioned ‘snail mail’ in a padded jiffy envelope. It was airmail from New York to West Bromwich, which I really appreciated. Thank you Mildred. WEST BROMWICH 1968: Dad recalled that Ida Mae visited England yet again in 1968, visiting London first before staying in West Bromwich at her brother Cecil’s home for a few days. AMERICA 1968: A half-century ago today, as I write, a black Baptist minister named Martin Luther King traveled to Memphis, Tennessee, to support and bring attention to a strike by more than 1,300 black sanitation workers. No one knew that this journey to Tennessee would cost King his life and change the trajectory and course of the civil rights movement in America. This is a short summary of who Martin Luther King was, what he fought for and the historical moments that led up to his infamous death. MEMPHIS, TENNESSEE: The rain was torrential at Memphis on the 1st February 1968. Black garbage collectors, however, were still required to work in those poor conditions. Robert Walker and Echol Cole took shelter from the rain in the back of a garbage truck, but the equipment malfunctioned and pulled them both into the compactor, horrificaly crushing them to death. Martin Luther King was a Baptist minister from Atlanta, Georgia and was the country’s most famous civil rights activist. When he heard about the work stoppage he decided to go to Memphis, Tennessee, to bring national attention to the strike. King was already well-known and had already come to national prominence in the United States by leading a bus boycott in Montgomery, Alabama, in 1955, after an African-American woman ‘Rosa Parks’ had been arrested for refusing to give up a front bus seat to a white man. King was later awarded the Nobel Peace Prize in October 1964. In June 1965, he visited the island of Jamaica. At Jamaica’s National Stadium in Kingston, King addressed a huge audience, where he was awarded the keys to the City of Kingston. The main stand at the stadium was packed with young Jamaicans. King’s tone was warm and personal. After the visit, King recalled in a speech, the profound impact that Jamaica — and Jamaicans — had upon him. He may have captivated his audiences with his powerful oratory, but he was also captivated by what he saw as a multiracial nation. LORRAINE MOTEL, MEMPHIS: On the 3rd April 1968, Martin Luther King and his entourage checked into the Lorraine Motel, Memphis. The Lorraine was one of the few motels in Memphis that was known as being friendly to African-Americans. King and his inner circle had been invited to have dinner at the home of the Rev. Samuel Billy Kyles, a Memphis minister. About 6 p.m., King, dressed in his trademark dark suit and tie, emerged from Room 306. Andrew Young, his close friend and partner in the civil rights movement, yelled up to him to grab his coat because the weather had turned chilly. But before he could answer, a shot rang out. A bullet fired by white racist, James Earl Ray, hit King in the right cheek, shattering his jaw, several vertebrae and severing his spinal cord. He was rushed to St. Joseph’s Hospital, where he was pronounced dead at 7:05 p.m. The killer was arrested two months later at Heathrow Airport, London. He was later sentenced to life imprisonment in the United States. Martin Luther King’s civil rights legacy lived on, helping to find racial equality for African-American’s In the United States…. That one day on the red hills of Georgia the sons of former slaves and the sons of former slave owners will be able to sit down together at the table of brotherhood. That one day even the state of Mississippi, a state sweltering with the heat of injustice, sweltering with the heat of oppression, will be transformed into an oasis of freedom and justice. That my four little children will one day live in a nation where they will not be judged by the color of their skin but by the content of their character. I have a dream today. That one day, down in Alabama, with its vicious racists, with its governor having his lips dripping with the words of interposition and nullification; one day right there in Alabama, little black boys and black girls will be able to join hands with little white boys and white girls as sisters and brothers. Martin Luther King’s Body Was Taken Back To His Hometown, Georgia. His Wife Coretta Survived Him By nearly 40 years. An interesting footnote to the singer Ray Charles…. In the 1960’s singer, Ray Charles ventured into black activism protesting and refusing to sing when he found that blacks and whites could not sit together at his concerts. He soon became friends with Martin Luther King. Both of these two African – American legends were born in Georgia. “Three interesting events have been covered during today’s blog, 1964 to 1968 – Back Home. The theme of the stories being based on being ‘Back Home’ My Aunt Cissy’s marriage at Southfield, Vin and Mildred’s visit to Southfield and the assassination of Martin Luther King in Memphis. I found the last article about Martin Luther King powerful and thought-provoking. Yet again, enjoyable to research, discover and write the history of those three subjects. My cousin, Vin was Mass Teddy and Mabel’s oldest grandchild, therefore he helped me to gain much knowledge, giving me lots interesting information of his time spent at Southfield. We spoke by phone many times. 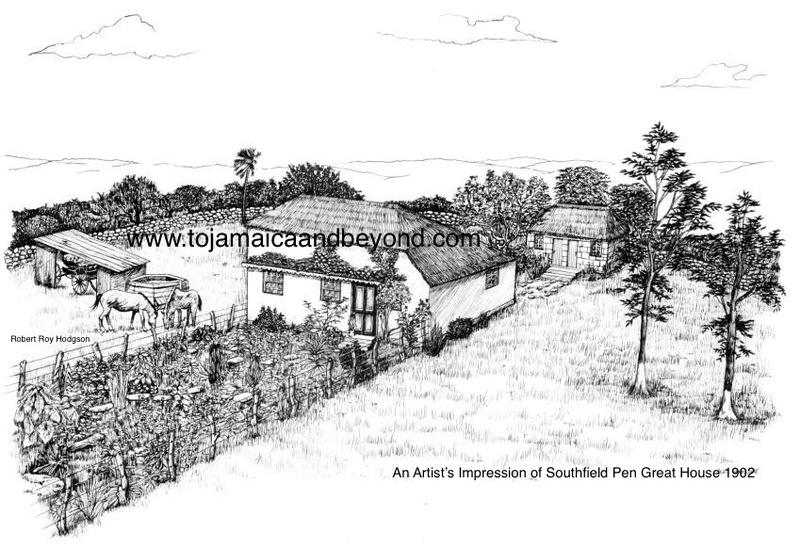 When I received the Southfield Pen photographs from my cousin Mildred in 2006, I was mesmerised. I instantly telephoned and thanked her. I then copied them and posted them back to her by airmail. Mildred got back in touch with me and said “They were for you to keep, you didn’t have to send them back! Such a nice gesture. Thank you Mildred. She told me that she was fortunate to have that full frontal photograph of the Hodgson Home because as she was walking away, for some reason she just turned around to have just one last look at the property and thought, I must take a photograph. It just goes to show that the best photo’s are not always the ones that are planned! My dad lived at Southfield Pen for a while. He knew it as Southfield House and has fond memories and stories about it. He first told me about it in 1999 when I started researching, saying that his grandfather Mass Teddy told him about the antiquity of it, saying that his ancient ancestors, the Bromfield’s, used to live in it. Dad thought the property was about 250 years old. I knew of Martin Luther King, having watched documentaries about him on English TV many years before I even took an interest in my families history. I didn’t know enough about how inspiring he was, the role he played in the civil rights movement, and the way that he helped in the fight for African-American racial equality in the United States. Ray Charles sings about his hometown Georgia. I have always liked this song, but learning more about Martin Luther King, and the happenings at Southfield, ‘1964 to 1968 – Back Home’ takes on a whole new meaning. My sincere gratitude for your dedication in bringing our family history to those of us who were in the dark. Continued success with your blog with the grace of God. Your cousin Carol in Canada. Thank you for the nice comment again! I’m glad you find it interesting. Keep reading and enjoy the rest of your christmas and the new year.